Look at what was in the front page of msn.com today!!! Where was anyone who thought to speak up of the starvation that was so widespread in these catholic—I won’t capitalize it—institutions??? If you delve further, it was noted that the nuns and priests had gourmet meals…how in the world did no one speak out for the children? If the pope refused to meet with victims he’d be called out on that too. The pope’s meeting with victims is just another empty gesture—how many meetings have there been with zero results? When Pope Frank turns over the perps and Cardinal Mahoney et al to law enforcement for due process, then we’ll know he means business and is truly sincere about wanting to help victims and prevent future abuse. He must have been one of the last honorable bankers (if there is such a thing). I hope and pray that the Father in Heaven brings justice to these people and the world, for I believe we’re living in the last days. Please keep praying for the true Light to win. Pope Francis is knowingly working for the devil. The last good pope to hold office was John Paul the 1st. And he was murdered. This video explains Ratzinger’s resignation. Oh and I forgot this: We all know that Pope Frank was elected to clean up the image, to window-dress as the church is so adept at doing. As he hasn’t been responsible for even one arrest, HE IS COMPLICIT! Maybe this is why Christ warned us not to call priests “fathers” (even HE didn’t foresee women doing this though, I presume). My God, I’m so sorry that happened to you and your brother. Believe me, these wicked people WILL be held to account on Judgement Day. They’ve secretly sided with the enemy but they’ll be powerless to defeat God. Justice will be achieved. While I and my brother were beaten with a stick and raped by a priest, it was the nuns who tortured, beat me, sexually abused me and finally smothered me with a pillow into a coma. They are truly Satan spawn and they need to be exposed and punished for their crimes along with the clergy “fathers” and the rest of the hierarchy up to and including the Pope who is ultimately responsible for all of their crimes. It just boggles my mind to know that nuns are part of this Satanic infiltration of the Catholic clergy and conspiracy against the innocent. It’s as though they don’t yet fear God and the Day of Judgement. If you want some concrete evidence about mean, cruel abusive nuns, look no further than Ireland and the Magdeline laundries…tales of pure terror. Ever wonder if the pope may know more than you do about the nuns? Just a thought. Everyone has the nuns held up as saints and angels. Anyone notice they have been deafeningly silent on the issue of abuse in the Church? There are reasons for that. According to a study commissioned by the sisters 40% of their own membership admitted to being sexually abused before or after entering the convent. Abuse needs to be dealt with, not just run away from, and if it is dealt with about 30% of victims still repeat the abusive cycle. 70% do not—if it is dealt with. So, the silence about abuse? Do the math. When the LCWR grow up and act like responsible leaders (note how they ridicule the mishandling of this by the bishops) and work with victims’ groups, and help in the healing process with victim/survivors then they might be a bit more respected for actually being mature women and honest, and not just highly educated academics and social workers who are ignoring their own victims. Just do the math. Cait Finnegan • a few seconds ago Hold on, this is waiting to be approved by National Catholic Reporter. This needs to be about more than just priests. Vowed religious women also abuse children and youth, and this continues to be totally ignored by the American Catholic population and the LCWR who claim no authority in this matter, yet do not hesitate to speak about and criticize everything the male clergy do or don’t do. 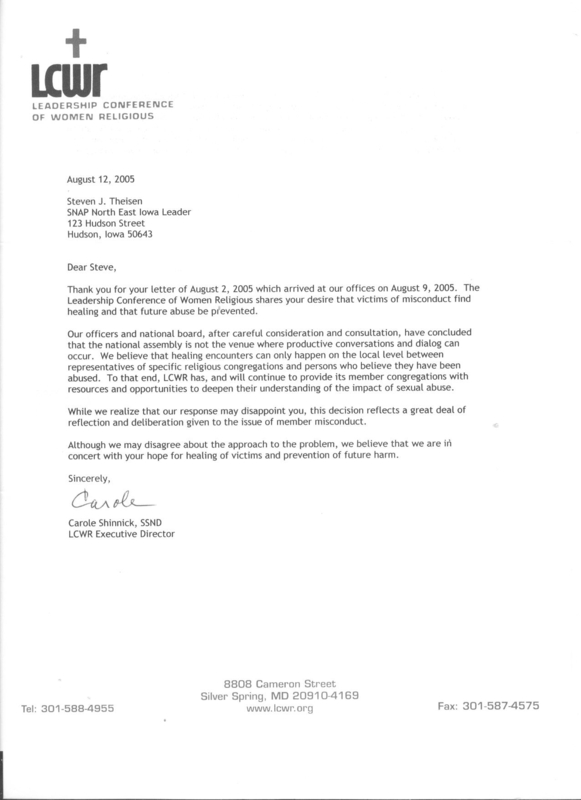 LCWR has a moral authority if not canonical, and needs to stop ignoring victims of abuse by nuns and victim support groups who need to be part of a Church-wide healing process. The Vatican is cracking down on LCWR for theological matters, but letting them just slip quietly by while pointing fingers at the priests and bishops. Women religious commissioned a study in 1996 about their own members, but the results were squelched—with good reason by those who didn’t want the public to know that 40% of nuns admitted to being sexually abused before or after entering the convent… We know that 30% of victims who were abused go on to repeat abuse, keeping the cycle going, and this converts to major numbers among the population of nuns in the USA now, and over double that in the 60’s when so much abuse occurred! Abuse is sexual yes, but the rage in an abuse victim who goes on to repeat the cycle presents not only as sexual abuse by physical as well. Sounding more familiar now? The rage in abused nuns who fled to convents did not disappear into prayer books. As a survivor of sexual abuse by a Sister of Mercy who died last week, I really think this issue needs to be dealt with, and nuns need to stop throwing stones at the Vatican and male clergy while living in glass convents. They need to do their own work of healing from abuse, and face this all very directly. http://abusedbynuns.wordpress…. My dad abused me, my brother abused me and I cried to the church, a priest said I should report them so I did. My dad and brother cried to the church, and the monastery I joined told me i never should have reported them and then my food and drink got laced with drugs. And I had a serious nervous breakdown and have been on disability ever since. My family had a lot of money, and needed to save face in the community, and the nuns needed money. So they did all sorts of bad things to me, some I blocked out and some things I remember. In my early 20’s I thought I would escape the abuse of my family, Now I am in my 50’s and finally getting away. It’s been a living hell for years. What the church teaches is a beautiful thing, yet what the religious practice is horrible. They are more concerned about getting money than doing Gods will. Looking perfect, than striving to be perfect, one thing is for sure, I’m happy I am not a religious. I feel sorry for them. It is disgust-and sad to read about my town-abbeville Louisiana on bishop accountability and to see a priest marshall larrivere who was a pastor and teacher at mt carmel school in abbeville who suppose to have raped a 13 year old-. This is the same era when a nun named sister mary carmel was there- she was very abusive in this school, yet NO one— has spoken about her or him in this area—, like they say’ no one wants to get involved’ but read the TRUTH ON SNAP—THEY WRITE IT PRINT IT SPEAK IT!!!!!!!!!!!!!!!!!!!!!!!!!!!!!!!!!!!! Rita, yes I did get in touch with Kevin Annett. He is very kind and supportive. I sent him my book. I looked at the videos you recommended and they were great. I’m going to put his information on my blog and he said he would like that. Thanks for the links.